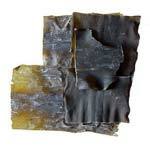 Brown Seaweed Supplement - Weight Loss Solution or New Sales Trick? Sea vegetables and supplements made out of them have been recently brought to light due to their long history of use especially in Japan and other Asian countries and the shockingly low instances of obesity and heart disease in these regions. Is this due to the common use of sea vegetables and brown seaweed specifically in the Asian diets? To answer this question and discuss benefits and drawbacks of brown seaweed supplement, let’s present some facts about what brown seaweed supplement is really made out of. There are 3 main types of sea vegetables, namely, brown, red and green sea vegetables. Some of the most popular types of sea vegetables are brown that are used in a variety of ways as flavor enhancers, dietary supplements and even in place of salt. You have probably heard before of Kelp, Kombu and Wakame, these are all brown types of sea vegetables that are used to flavor Japanese miso soups, added into salads and main dishes. Brown seaweed supplements are manufactured using one or several types of sea vegetables and are available in various forms such as capsules, extracts and dried forms. There are numerous health benefits of taking brown seaweed pills, supplements and extracts, including, cancer fighting properties, reduction of inflammation in the body, enhancing thyroid function and providing body with rich sources of iodine, folic acid, magnesium, calcium, iron and other vital elements. Additionally, brown sea vegetable extracts contain important substances called fucans that fight inflammation and provide detoxifying benefits including weight loss. According to Dr. Oz, the most effective weight loss component of seaweed extract is Fucoxanthin that works by maximizing metabolism at a cellular level that helps you shed pounds easier especially in your midriff area. This could be intensified if you take 500mg of Fucoxanthin supplement along with 2 ml of black licorice extract daily. However, individuals who are prone to hypertension should not take black licorice extract to avoid developing a dangerous condition. Due to brown seaweed Dr Oz endorsements, the popularity of such supplements grew at staggering proportions, especially Modifilan Fucoxanthin weight loss capsules. But have there been any clinical studies to validate these statements and prove that Fucoxanthin is indeed a super fat burner? According to Kazuo Miyashito, PhD (Japan) who has conducted clinical trials of the Fucoxanthin supplement use on rodents, it has been established that rodents did in fact showcase elevated levels of special fat burning proteins after consuming foods with Fucoxanthin supplements added. However, such studies are too limited to draw any final conclusions and more research is still needed. With all these multiple benefits, it’s easy to get carried away and think that brown seaweed supplements are the ultimate weight loss panacea that can make you lose weight easily without any efforts on your part. Is this true or is there a dirty little secret that lies under the surface of the seaweed supplements? Indeed, consumption of virtually any type of supplement is not supported by the FDA and is basically on a “take at your own risk” basis. Additionally, some sea vegetable supplements that were harvested from the polluted ocean and sea areas contain massive quantities of heavy metal traces that virtually negate any potential benefits gained. Moreover, if you consume such seaweed supplements without discussing them with your doctor you are running a risk of throwing thyroid hormone production out of balance by taking too much iodine and potentially cause internal bleedings in some cases. Bottom line, in order to gain maximum seaweed supplements benefits, by all means follow your doctor’s guidelines, especially if you have any pre-existing medical conditions. Do your own research and only buy from companies who have pledged using only pure sources for Kombu, Kelp or Wakame sea vegetables to avoid dangerous contaminants.